One of the sessions that made the biggest impact on me was “North Carolina and the Digital Public Library of America.” I’ve long been fascinated by the DPLA, and hearing about contributing to the DPLA from the point of view of the staff of a service hub (the North Carolina Digital Heritage Center) and from a contributing institution (Wake Forest University) definitely inspired me to think about whether an agile development cycle like the one employed at Wake Forest might work for Davidson. We currently have contributed 404 items to the DPLA, but this is a great time to plan what our next contributions and digitization projects will be. Another one of my favorite parts of the day was the plenary luncheon presentation by Sarah E. Koonts, Director of the North Carolina Division of Archives and Records. Koonts filled in SNCA members on trends from archives around the U.S., with a focus on advocacy and outreach. 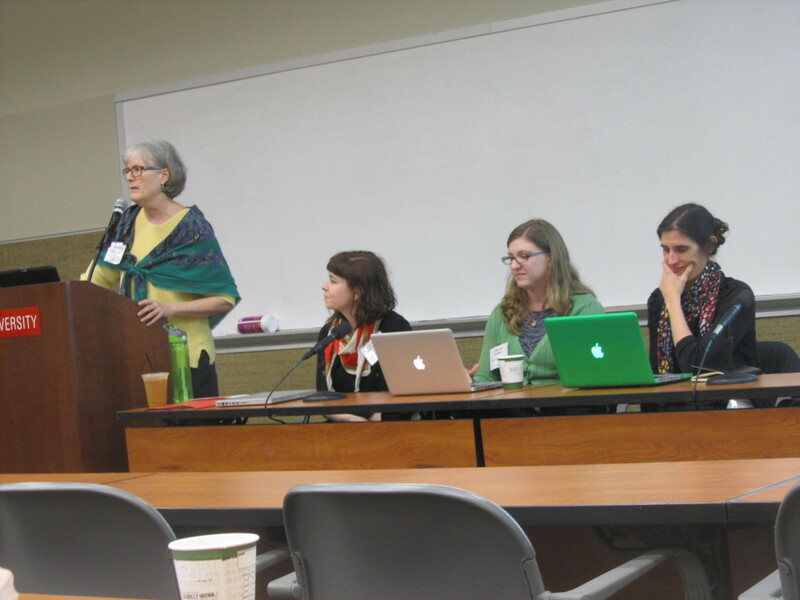 Throughout the day of the SNCA conference, I was liveblogging as part of my participation in Day of DH, a digital humanities community-building project. I wrote a bit more on my blog there about what I got out of the plenary, but my main takeaway is that archival advocacy is incredibly important to the field, yet often hard to teach in graduate programs. When I asked Susan about what she felt the biggest takeaways from SNCA were, she emphasized the serendipitous nature of discovering new tools and methods when at professional gatherings. In particular, she’s been playing around with Jason Ronallo’s (North Carolina State University) CSV-to-EAD conversion application, Stead, and freeformatter.com‘s CSV-to-XML convertor since SNCA. I’ve never stopped to count but I’ve probably been to 30+ SNCA meetings during my time at Davidson. Over these years I’ve gained much support, information, professional growth and new ideas from SNCA and this meeting was no exception. My official duties in relation to this springs’ SNCA meeting included being a part of the nominating committee and moderating a panel. Unofficially, it was a time to reconnect with colleagues, chat at poster sessions, and gather ideas for new projects. After a presentation by archivists at UNC Greensboro, highest on my “let’s do” list is getting our scrapbooks digitized. We have scanned individual images but have yet to tackle the trickier process of scanning whole pages. My first thoughts were of our student scrapbooks – and following UNC-G’s example, I began mentally counting all the scrapbooks from student organizations and campus departments. The numbers could be a bit daunting but bringing Davidson history online through the scrapbooks is an exciting prospect. 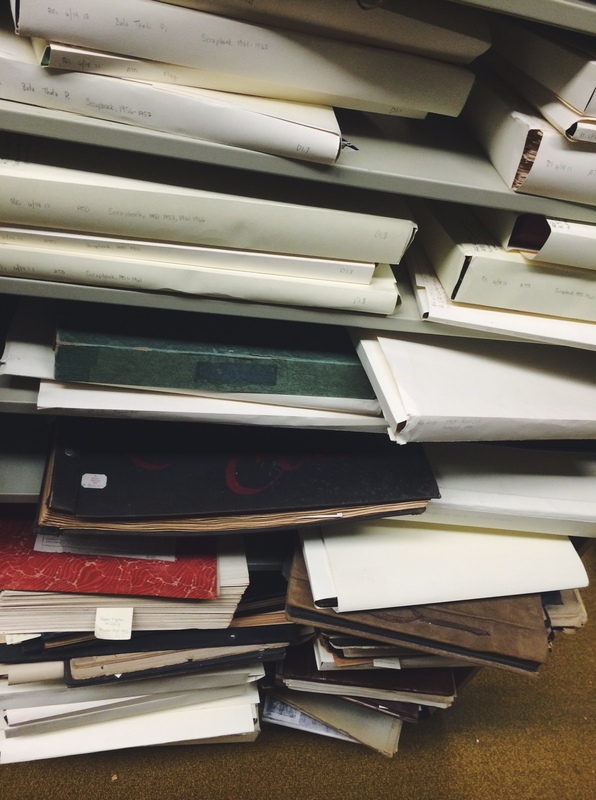 A few of the scrapbooks that Jan referred to – plenty of material to work with! We each left the SNCA conference with a different set of takeaways… now to get to work figuring out what we can implement!